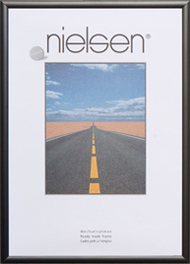 The Pearl Range by Nielsen hosts a simple and neat design that allows your artwork to do the talking. The Pearl Range by Nielsen hosts a simple and neat design that allows your artwork to do the talking. These slim frames provide a robust way of framing your artwork while providing cool modern style to suit any picture or interior. Enjoy elegant light absorption around your photograph, perfect for those bright, well-lit areas of your home or office. Choose from matt black, gloss white, silver, polished silver or gold. The Pearl Range is ideal for poster frames and large scale artworks.